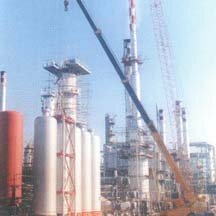 This section discusses the tools and procedures that are required for the construction of the stills described in this guide. Experienced handymen and craftsmen can skip this part by clicking here. Overall, the construction of either still is quite straightforward. First the top end tubing components should be cut to length. Then, if you're building the Internal Reflux model, the condenser shell caps should be drilled. All the top end parts should then be assembled with their fittings to check the fit. Finally, the column should be drilled to match and fit the upper and lower cooling tubes that supply coolant to the condenser shell. The Valved Reflux model is simpler to build in that the condenser shell end caps and the column does not require drilling and solder fitting. When all the dry fitting is complete, the parts should be dis-assembled and prepared for soldering. Making a good sweated joint with copper tubing and fittings is the only real skill that is needed to build either of these stills. It is an easy skill to acquire, but it does take a little practice to get it right if you've never done it before. To do it right, the parts to be joined must be scrupulously clean. The clean up can be done with any appropriate tool such as sandpaper, wire brushing, or polishing with steel wool. When it's ready for soldering, the joints should have a bright, almost golden color. The joint should then be fluxed. When you buy the lead free solder for this project, make sure you get the proper fluxing compound to match. Spread the flux evenly over both joint surfaces with a small fluxing brush or similar applicator, and assemble the joint. The secret to sweat soldering is to make sure the entire joint is evenly heated to the point where it will melt the solder when you apply the solder to the joint. Sometimes this can be difficult with large diameter tubing (2-3") because the tubing draws a lot of heat away from the joint. Make sure your torch has enough capacity. Turbo flame propane torch heads are the minimum you should consider for this purpose. They are available at most hardware stores. Once the joint is hot enough, the solder will run freely around the joint and will be sucked into the joint by capillary action. While keeping the heat at the bottom of the fitting (not on the joint) feed the solder wire around the joint until a small bead at the top of the joint appears. Then, with a shop rag (or leather gloved hand), wipe this bead of solder from the joint and remove the heat. This will provide an even tin finish to the joint. With a little practice, you will soon find you can even make the solder run uphill towards the heat source, and that you can solder the joint without re-positioning the assembly. Whenever possible during the soldering of the assembly, clean out the inside of the joint, after soldering, with a brush and solvent to remove any flux or oxidation debris before going on to the next joint. It will make your first batches taste a lot better. There are really two kinds of soldering. 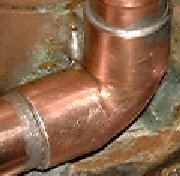 The first, discussed above, is done at relatively low temperatures (below 800º F. and usually about 450º F.) and is widely used in the plumbing and electrical trades. The solder commonly used was a 50/50 mixture of lead and tin. The second type, long referred to as silver soldering, or silver brazing is done with a silver alloy that melts in the 1100º to 1600º F. range, depending on the amount of silver in the alloy. This commonly varies between 45% to 70%. Unfortunately, the advent of lead free soldering requirements for the low temperature applications, has resulted in some solder being marketed as "Silver Bearing" or "Silver Solder". These lead free solders contain only a fraction of a percent of silver and they melt at temperatures in the 430º F. range. They should not be confused with the solder used in the silver soldering or silver brazing process. This distinction is made at this point because, with one exception, all the fittings in the stills presented in this guide are all soldered with a low temperature lead free solder. 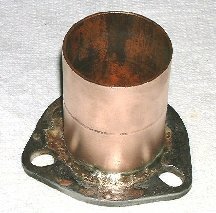 The one exception is the joint in the reflux column flange adapter where a copper coupling is joined to the steel exhaust flange with a 45% silver alloy that melts at about 1370º F.
This temperature is below the melting point of either the copper coupling or the mild steel flange, and the parts can be attached with a propane/Mapp® gas hand torch. Now that we've got all the generalities out of the way, it's now time to begin the actual construction of your still. The next button below will take you to the Internal Reflux still section.. If you prefer to build the Valved Reflux model, please click here.